I am not gonna lie. This dish is not one of the quick meals to make in a hurry. This one will take some time and effort. However at the end you will be rewarded with divine combination of flavors. Cashew cream, provides a delicious base for the vegetable topping. The creamy layer makes this tart rich-tasting, even without cheese. This is one tart that you would want to make over and over again. There is so much flavor in it. Enjoy it with group of friends or family dinner, it works great as an appetizer as well as main dish served with salad. Oh and did I mention that it’s gluten free and vegan? Preheat the oven to 425 degrees F. Slice the greens off the beets and scrub the outsides. Rub them down with oil of your choice then wrap tightly in aluminum foil. Clean the bell peppers, slice them in half and remove seeds. Repeat the same -rub them down with oil of your choice then wrap tightly in aluminum foil. Roast both vegetables for 1 hour, or until tender enough to slice. Unwrap the veggies and let cool until they are comfortable to the touch. Once cool, rub the beets to remove the skin. It should peel right off! Using a sharp knife, slice the beets and peppers into 1/4-inch slices. Turn the temperature of the oven down to 400 F.
Flatten the dough into a disk on a floured work surface (use all purpose or gluten-free flour for the work surface) Roll it out with a rolling pin to about 1 inch larger than the diameter of your tart pan. Carefully transfer to the tart pan, pressing it into the bottom and sides. Trim off any excess. Cover the crust lightly with foil (don’t press), and bake at 400 F for 10 minutes. Let cool slightly. Puree all of the cashew cream ingredients in a food processor until very smooth and thick. This will take several minutes, and may require scraping down the sides of the processor. If the mixture seems to dry to become creamy, add one or two teaspoons of water as needed. 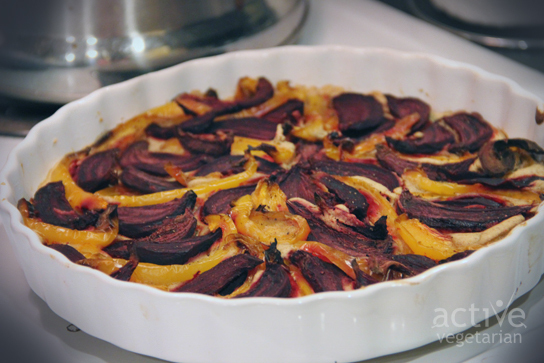 Top the partially-baked crust with the cashew cream, then nice arrange beets and bell peppers on top. Return to the oven and bake for 20 minutes longer. Serve warm or at room temperature. 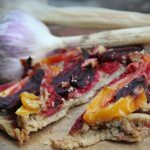 How do you feel about beets, do you have a favorite way of using them, what is it?